This is one question that many of you have asked. 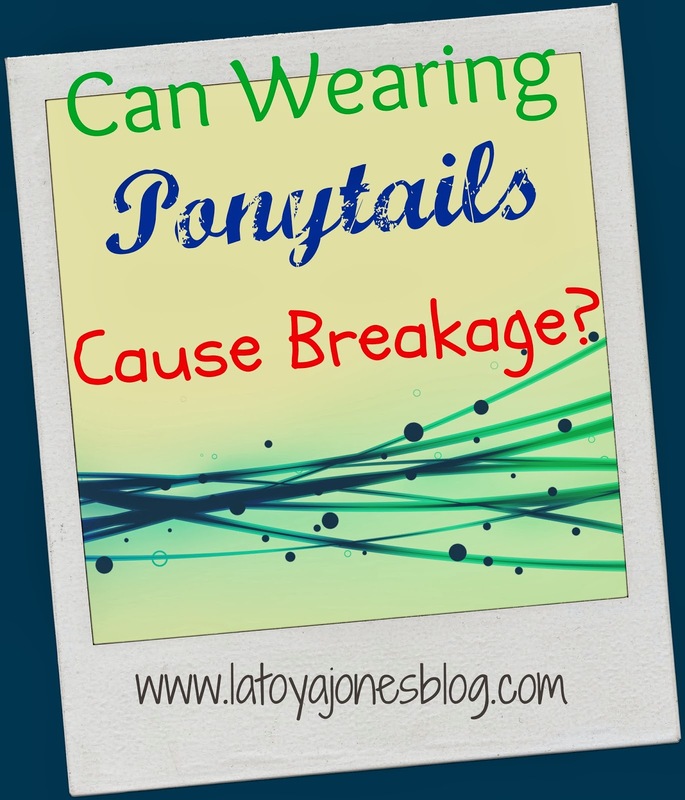 Can wearing ponytails cause your hair to break? Well I am hear to answer your question. 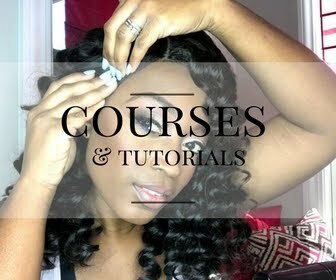 There are a lot of factors that play into the causing of your hair to break in relation to ponytails. It is not the actual ponytail itself that is causing the breakage. But the answer to the question is yes. Wearing ponytails can absolutely cause breakage. Now let's get into the why. I have one client in particular that wore ponytails on a consistent basis. She wore them in the exact same spot every time for days on end. Over time her hair began to break right in the spot where her ponytail was. This is because the hair was being stressed by the constant pulling that comes with putting it in a ponytail. Too much stress on the same area constantly caused severe breakage in that area. I noticed the breakage at one of her hair appointments and immediately began a course of action. First thing first, I told her to no longer where her hair in that ponytail, but instead to wrap the hair every night. She had apparently been sleeping in the ponytail as well which is another no-no. If I would have simply began giving her treatments before telling her this it would have been a waste of products because I would have only been treating the problem instead of getting to the root. 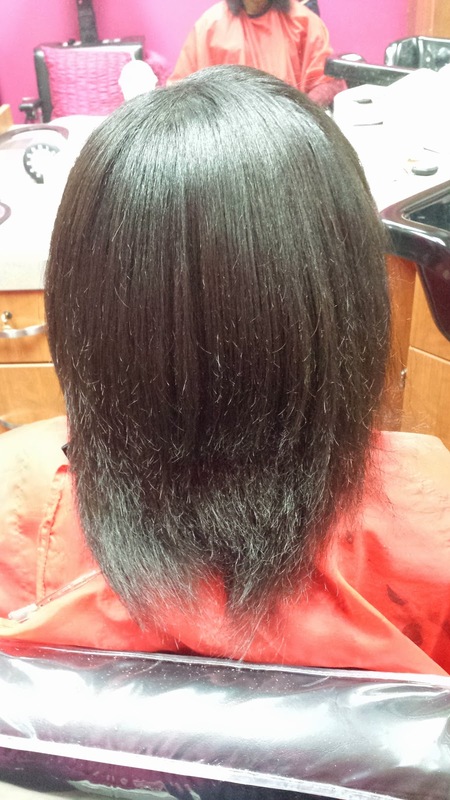 I did not take a picture of how short her hair was in the area that broke off but at her last visit, I took pictures of how much it has grown. 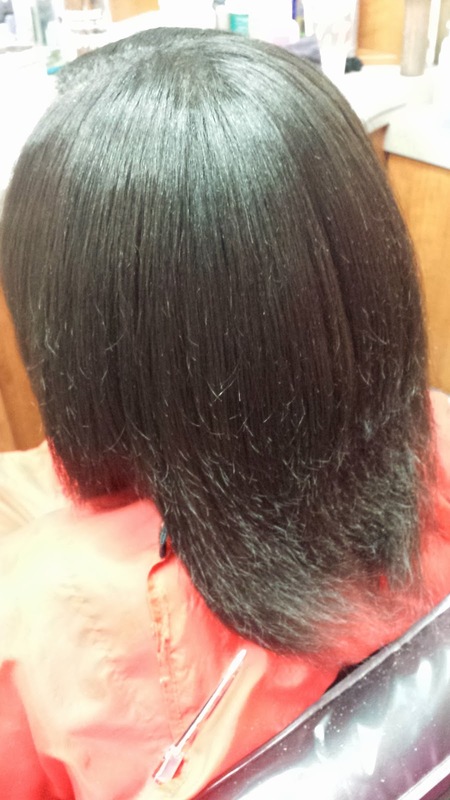 The picture above shows the growth since I have been treating her hair. 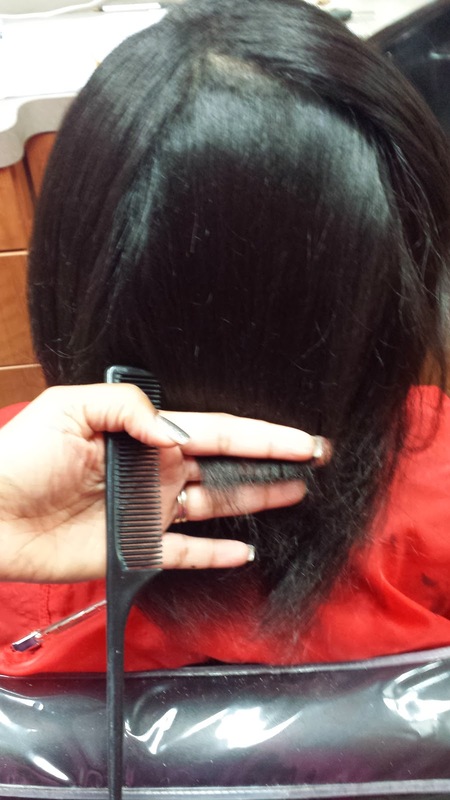 With the initial damage, the hair was a little shorter than the top of the black comb. It has been a few months and her hair is still not all one length yet, but now it is at least at a length that leaves the part that broke a lot less noticeable. The pictures above and the one below shows a little bit better just where the part that broke stops. It is a few inches short of the rest of the hair. I could layer her hair to make it all blend but she decided to just let it catch up instead since it is growing at a good pace. 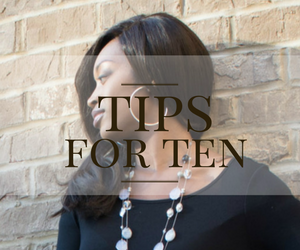 I will also continue to give her a trim on a regular basis of every 10-12 weeks in order to keep the split ends down to a minimum. 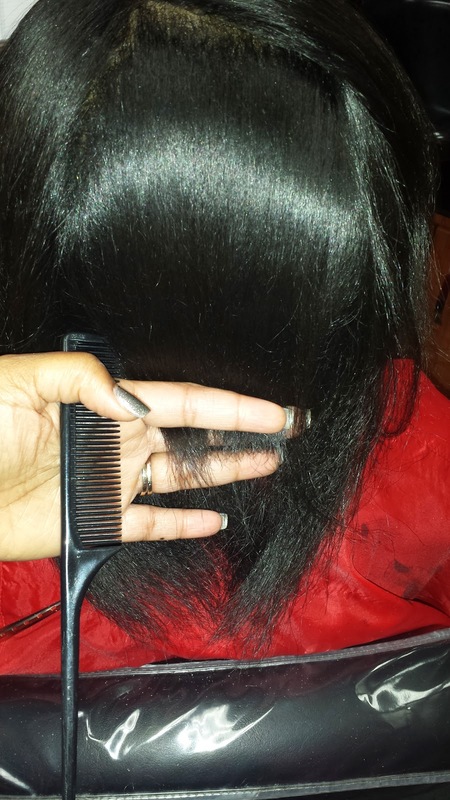 To give you a better idea of how easy it is now to blend the hair, here is a pic of all of the hair combed down. There looks like a gap in the middle of the hair at the bottom but once all of her hair is back one length, it will fill that part back in. So, there is nothing wrong with wearing the occasional ponytail every now and then. 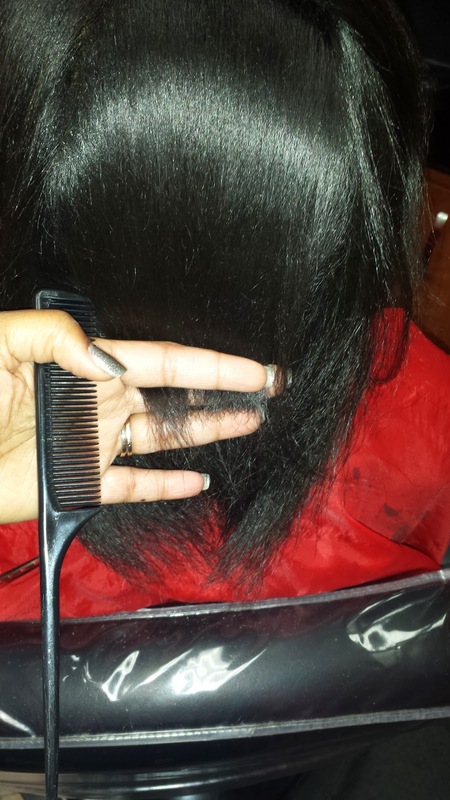 However, constantly doing so, especially in the same spot for prolonged periods of time can cause the hair to break. 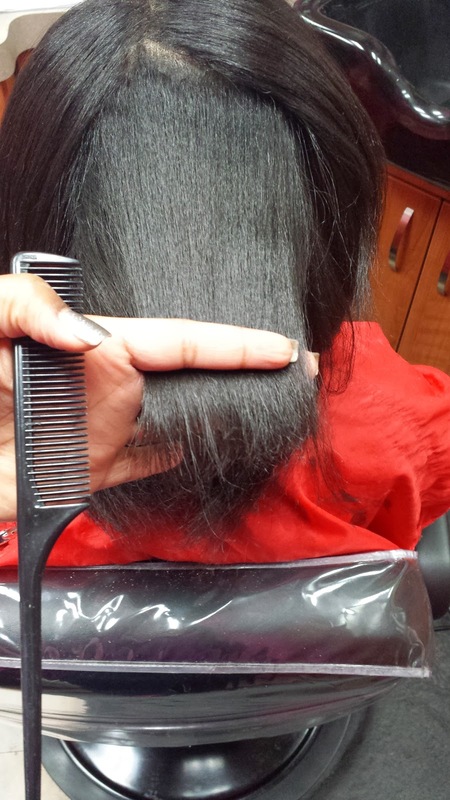 And definitely be careful of how tight you pull it, since the edges are the most fragile part of the hair. They break very easily so be extremely careful. It is very rare that I myself wear ponytails, but I do rock a bun on my bad hair days. 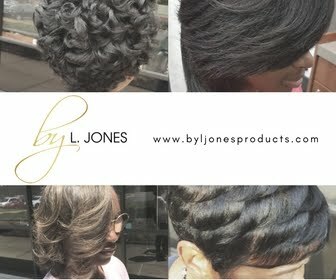 From now on, my advice to my client was to avoid the ponytails for now and just stick to wrapping the hair. Once the hair grows all the way back and gets 100% healthy again she can proceed with caution on the ponytails, but I would advise to never sleep in them since we know that they have caused breakage on her before. Great post LaToya! I try to remember to pull my hair up differently every day to prevent such damage. 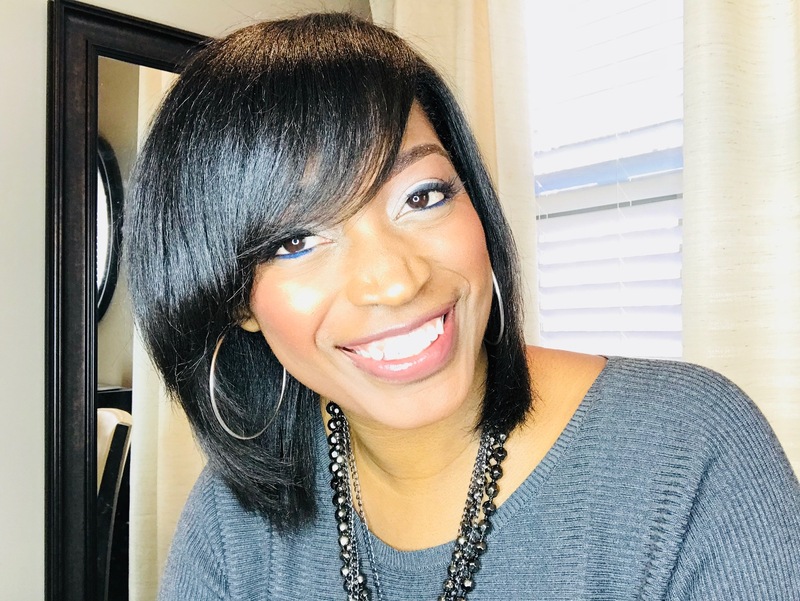 Great post~this is exactly what happened to me, so it's great to see that taking care of the area where breakage takes place helps the hair grow back. I will definitely take your advice and trim it every so many weeks. Thanks for the info! Great post, I have definitely suffered from this. I was trying to figure out what has caused my hair to break at the nape area and this is exactly the reason. I wear pony tails religiously and I think over time the tension has caused my hair to break off. I have only just noticed it. I am going to take your advice and switch up my hair styles & also trim.